If your garage is due for an upgrade, look no further than Custom Garage Works! We have been providing a selection of custom garage services such as garage floor coating in Kaufman, TX since we originally opened in 2003. After searching high and low in the existing industry, we were surprised to find very few options that were up to a top quality standard, so we jumped into the industry ourselves, to turn things around. 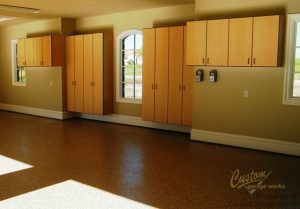 We now provide our clients some of the best custom garage solutions around, including top quality cabinets and incredibly durable floor coatings that out-preform epoxy coatings. We are committed to excellence, and we love providing premium garage floor coating and custom garage solutions throughout the DFW area. 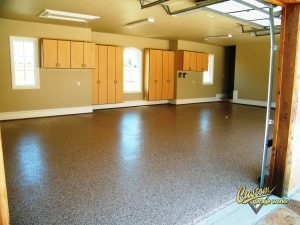 Our custom garage floor coating in Kaufman, TX is one of our most common garage options! This coating is so popular because it is both more durable, and cures faster than traditional epoxy. Unlike epoxy that will yellow in the sun, and peel or flake over time, these coatings are stronger and more durable. In addition to our floor preparation, which incorporates professional diamond grinding, as opposed to acid etching, you end up with a showroom quality floor that is simple to clean, and practically indestructible. If you are interested in learning more about our garage floor coating service, please schedule your free estimate when you call 214-494-9068 or 817-308-1305. Garage Floor Grinding Our garage floor grinding method is the best system to properly prep your concrete for a coating system. Epoxy Coatings Epoxy coatings are a popular form of garage coating, but they are not the best option available! Polyurea Polyaspartic Coatings These coatings have a faster cure time than epoxy, and are resistant to UV rays and heat. And More! You can discover more about the garage floor services we offer here! If you are running out of space in your garage, Custom Garage Works has the right garage storage and organization solution for you! Your garage looks best when it is clean and organized. With products such as garage cabinets and overhead storage racks, we have a variety of solutions for our clients’ garage organization needs. All of our Bulldog cabinets are secured to the wall for additional safety, and our overhead storage racks are stronger and more dependable than many others you will find on the market. For a dependable garage floor coating in Kaufman, TX that will last for years, and an organization solution that cannot be beat, you can depend on Custom Garage Works! Overhead Storage Racks Don’t waste your overhead space! Our overhead storage racks let you get more from your garage. Storage Cabinets Unlike kitchen cabinets, these are designed specifically to let you get the most out of your garage space! Car Lifts A residential garage car lift is easier to operate than you may think! And More! Our organization solutions are affordable and efficient methods to improve the aesthetic and atmosphere of your garage.